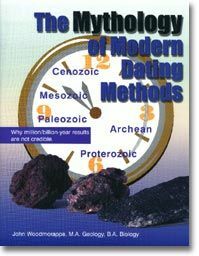 The Mythology of Modern Dating Methods is a very important book, not only for creationists but also evo­lutionists. John Woodmorappe has compiled in one compact technical monograph practically every excuse, rationalisation and explanation employed by geochronologists to dismiss ‘wrong’ dates. And there are a large number of discordant dates, only a fraction of which see the light of publication. He does all this in a lively, challenging manner with almost 400 references to the technical literature. The evolutionist can profit from this book, if he can cope with the some­times-harsh criticisms, by realising that he has taken dating methods too much on faith. As mentioned by Dr Henry Morris in the foreword, and emphasised by Woodmorappe, dating methods are foundational to the anti-biblical philosophy of uniformitarianism and evolution. Most people assume, without thinking too deeply about it, that with millions and billions of years of time, almost anything can happen. Evolution then becomes plausible in their minds. These dating methods are likely the main reason why many Christians have compromised the clear Word of God by believing the results of uniformitarian thinking. Such Christians, I believe, find it difficult to comprehend how so many highly intelligent and knowledgeable scientists can be so wrong in their dating methods. It seems that these Christians, many of them leaders in seminaries and Bible schools, believe computerised dating is straightforward and the resultant millions and billions of years are a matter of fact. The trouble is, they have not delved too deeply into the subject of geo­chronology; they trust in the results too much. This book should shake these beliefs and dispel the incredible mythology surrounding modern dating methods. The unprovable assumptions are not the only problem with radiometric dating. A bigger concern is in the way the results are handled. One huge problem is that the results published are only a selected sample, chosen especially to agree with preconceived ideas about the earth, life, and evolution. Geochronologists do not deliberately choose a rock sample that will give a ‘wrong’ date. Rather, it is after-the-fact, when the result disagrees with what is expected, that the sample is deemed to be defective. Woodmorappe compares this process with floating helium balloons for shooting practice. If the date is not obviously ‘wrong’ it is floated (pub­lished) to see whether anyone will try to shoot it down—whether there are some factors, not previously con­sidered, that would disqualify it. Amazingly, there is a complete ‘catalogue’ of standard rationalisations that are used to account for dates that disagree with what is expected—more on this later. The dating balloon can be shot down at any time, even after many years of floating around in the literature. Most of Wood­morappe’s book delves into these rationalisations that are used to explain away the dates when it suits. Woodmorappe uses numerous quotes to demonstrate his points—the long-ager’s own words from the literature. Upon reading the book, some may think that Woodmorappe is exaggerating. However, when studying the geological literature, it does not take long to come across these ration­alisations. I have encountered practically every one of the excuses, plus many overly optimistic statements touting the merits of a particular dating method. In fact, this phenomenon is described in detail, showing how practically every dating method was first advanced with optimistic statements about its expected great accuracy, only to have the claims qualified and challenged as many problems were progressively dis­covered. Rationalisations are after-the-fact reasons to discard ‘wrong’ dates. 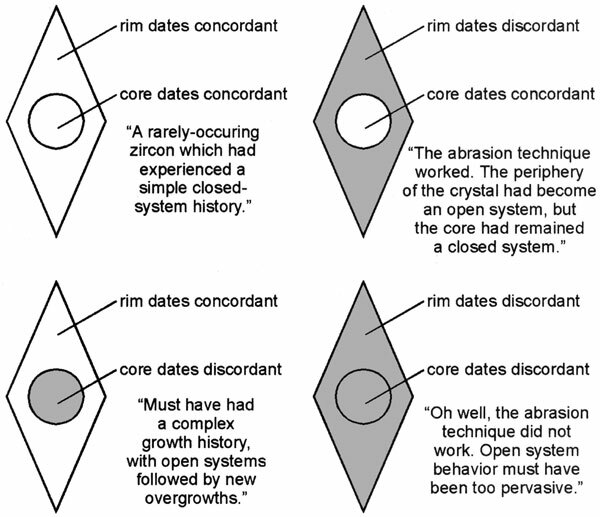 Some of the more common ones include: open system behaviour, mixing behaviour, special conditions that operated in the magma chamber, hydrothermal alteration, weathering, hidden xeno­crysts,2 innumerable ‘metamorphic events’ that reset or partially reset the dating method, etc. 1) CDMBN — Credit Dating Methods (for ostensible successes); Blame Nature (for failures). If the date is ‘good’ the method is given the credit, but if the date is ‘bad’ there is some problem with nature that disturbed the system and gave the wrong result. 2) ATM—Appeal To Marginal­isaton (minimising the failure). If the date is ‘wrong’, don’t worry. It is only a small isolated incident and does not impact on the unquestioned reliability of the dating method itself. 3) ATT—Appeal To Technicalities. Of course the date was wrong. We would expect a wrong answer in this case because … (of some technical reason). These are serious claims. If all this is true, some may be thinking, why don’t other scientists discover it? Surely Woodmorappe is not claiming that geochronology is a huge conspiracy. The reason why the exaggerated claims of geochronology continue, Woodmorappe explains, is not because uniformitarian scientists have a clandestine plan to deceive the public, but because they have a common belief in the underlying assumptions. They have a common worldview—a ruling paradigm. Furthermore, because of social factors such as peer pressure, the competition for grant money, and the reinforcement syndrome, the straightjacket of the paradigm keeps everyone in line. 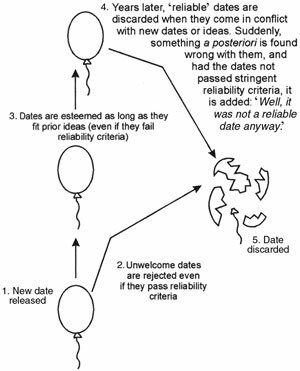 The reinforcement syndrome—the practice of finding the same date or results (after rejecting many ‘trial balloons’), is the main force per­petuating the mythology of the dating methods. But don’t the dating methods agree with the fossil dates that were used to set up the geological column? Surely this proves that the dates and evolution are both true, according to uniformi­tarian arguments. Not so. Wood­morappe shows how this agreement is a forced agreement dictated by the ruling paradigm. It is the ages of the fossils in the geological column that are presumed to be correct, and the results of the other dating methods must agree. Otherwise they are judged to be wrong. Woodmorappe well illustrates the power of the ruling paradigm by the way the Cambrian/Precambrian boundary has been dated. In this example, the dates obtained by geochronology have simply con­formed to the presumed date of the boundary that was set before the turn of the century—before geo­chronology was invented. But don’t the various dating methods ‘agree’ with each other? Surely when several independent dating methods all arrive at the same date, the result has to be correct? This is a powerful uniformitarian argument, but it too is a facade. Woodmorappe shows that all this supposed ‘agree­ment’ is really quite artificial. He even dedicates chapter 9 to an exploratory study demonstrating that some dates will agree just by chance. In the study he assumed that the dates published represent all the dates measured, a conservative assumption since in practice only a selection of the measured dates are published—those within range of the ‘correct’ value. Nevertheless his preliminary work shows that dates from the same or different methods can agree by chance some of the time, and this may well be enough to explain what occurs in practice. Thus, with all the myriad of rationalisations, all the different dating methods can be coaxed to the ‘correct’ date as determined by the fossils and geology. Those who do not think that dates can be manipulated to agree, should read Marvin Lubenow’s book, Bones of Contention.6 In appendix A, The Dating Game, Lubenow demonstrates from the dates published in the literature how six different dating methods ‘agreed’ that Richard Leakey’s skull 1470 was 2.6 to 2.9 million years old. That was not the end of the story because all these dates were later rejected, reworked, and made to ‘agree’ on an age of 1.6 to 1.8 million years. John Woodmorappe’s book is a devastating critique of the mythology of modern dating methods. A generous supply of diagrams is used to illustrate the points in an incisive and often humorous way. The book has an index and an innovative new feature—100 frequently asked questions about radiometric dating and where to find the answers. If you are familiar with dating methods, you should have no trouble understanding this book. However, non-scientists and those without training in geology, geophysics or geochronolgy may find it difficult to follow some of the arguments. For these people an appropriate introduction to dating methods in general, and selected methods in particular, would have been helpful. 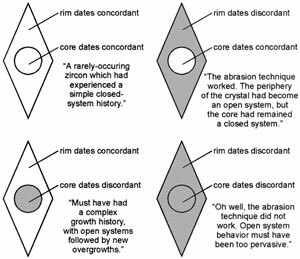 For example, it would have been advantageous to briefly describe the 40Ar/39Ar method and also explain how zircons are dated by the U-Pb method. Also, a glossary would have been useful. To make the information from this book available to a wider audience, I recommend more descriptive and explanatory information in the next edition. Nevertheless, the non-scientist can still profit greatly from the book; they can get the gist of the problem, and have an excellent selection of quotes at their disposal—quotes that are very revealing. There are big problems with the millions and billions of years that radiometric dating methods produce. The Mythology of Modern Dating Methods is highly recommended for everyone—creationists, earth scientists and non-earth scientists alike—especially evolutionists! Morris, J. D., The Young Earth, Master Books, Green Forest, Arkansas, 1994. Return to text. A xenocryst is a foreign mineral crystal in an igneous rock, unrelated to the igneous rock body itself. Return to text. Woodmorappe, J., The Mythology of Modern Dating Methods, Institute for Creation Research, El Cajon, CA, p. 42, 1999. Return to text. Paul, C., The Natural History of Fossils, Holmes and Meier Publishing Co., New York, p.184, 1980. Return to text. Woodmorappe, Ref. 3, p. 14. Return to text. Lubenow, M.L., Bones of Contention — A Creationist Assessment of Human Fossils, Baker Book House, Grand Rapids, Michigan, 1992. Return to text. Woodmorappe, J., Studies in Flood Geology, Institute for Creation Research, El Cajon, California, 1999. Return to text. Austin, S.A., Excess argon within mineral concentrates from the new dacite lava dome at Mt St Helens Volcano, Journal of Creation 10(3):335–343, 1996. Return to text. Snelling, A.A., The cause of anomalous potassium-argon ‘ages’ for recent andesite flows at Mt. Ngauruhoe, New Zealand, and the implications for potassium-argon ‘dating’; in: Walsh, R.E. (ed. ), Proceedings of the Fourth International Conference on Creationism, Creation Science Fellowship, Pittsburgh, Pennsylvania, pp. 503–525, 1998. Return to text. Rugg, S.H. and Austin, S.A., Evidences for rapid formation and failure of Pleistocene ‘lava dams’ of the western Grand Canyon, Arizona; in: Walsh, R.E. (ed. ), Proceedings of the Fourth International Conference on Creationism, Creation Science Fellowship, Pittsburgh, Pennsylvania, pp. 475–486, 1998. Return to text. Austin, S.A., Are Grand Canyon rocks one billion years old? in: Austin, S.A. (ed. ), Grand Canyon—Monument to Catastrophe, Institute for Creation Research, El Cajon, California, pp. 111–131, 1994. Return to text. Austin, S.A. and Snelling, A.A., Discordant potassium-argon model and isochron ‘ages’ for Cardenas basalt (middle Proterozoic) and associated diabase of eastern Grand Canyon, Arizona; in: Walsh, R.E. (ed. ), Proceedings of the Fourth International Conference on Creationism, Creation Science Fellowship, Pittsburgh, Pennsylvania, pp. 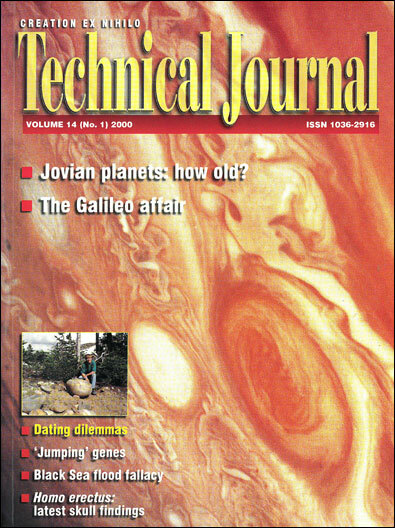 35–51, 1998. Return to text. Vardiman, L., RATE group prepares status report; ICR Impact #314, Institute for Creation Research, El Cajon, California, 1999. RATE, derived from Radioisotopes and the Age of the Earth, is an inter-disciplinary group of six creationist scientists formed to investigate the radioisotope data from a young-earth perspective. Recently the group announced a five year research programme estimated to cost some US$500,000. Return to text. Woodmorappe, Ref. 3, p. 41. Return to text. Woodmorappe, Ref. 3, p. 85. Return to text. Snelling, A., Radioactive ‘dating’ in conflict: Fossil wood in ‘ancient’ lava flow yields radiocarbon, Creation 20(1):24–27, 1998. Return to text.